This is a really fun, pulpy novel that mashes up a ton of different genres. While I don't read much in the kaiju genre, I'm definitely a fan of the Cthulhu mythos, so there was plenty to keep me engaged in the story. I particularly enjoyed how the novel incorporated a large, diverse cast of characters. It was also cool to have the book set in and around Portland, Oregon. Of the kaiju stuff I've read or seen, it seems like they're always set in much bigger, well-known metropolitan areas, so having it set in the Pacific Northwest was a fresh breath of air, so to speak. OMG this was so much fun. Great and Dread Cthulhu finally wakes from his ancient slumber and the world is going down the tubes to the screaming, squirming darkness that devours the human soul.There's a lot of great characters, warped cultists, and we actually have Cthulhu make a full on personal assault on the human race.Enough eldritch horror to do HPL proud and enough fun to keep modern audiences interested.Well worth the read. 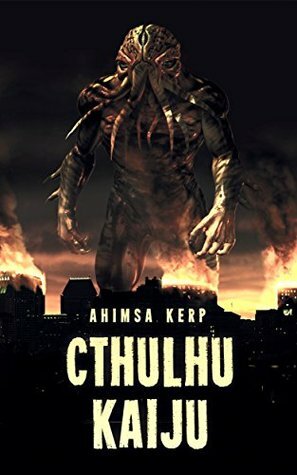 Far more kaiju than Cthulhu. I've no idea whether Daikaiju is an extant literary genre, but if it were I guess this is exactly what it would look like. This was so much better than I expected! I've been reading so many stories in the Mythos that it's begun feeling super repetitive and stale but THIS I really enjoyed. Ahimsa Kerp - Ahimsa Kerp is the author of EMPIRE OF THE UNDEAD, CTHULHU KAIJU, and BENEATH THE MANTLE from Severed Press and co-author of the mosaic fantasy novel THE ROADS TO BALDAIRN MOTTE from Reputation Books, as well as a contributor to many anthologies including CTHULHUROTICA and DEAD HARVEST. Ahimsa hails from the Pacific Northwest but has been living overseas since the aughts.